Who needs Red Velvet cake when you can have this savory, beautiful, garnet red dip with fresh, healthy vegetables…and quite festive too! Beets are very healthy for you, garlic & beans are too. This dip is almost fat-free; the fat that is in it, comes from the olive oil which is good for you as well. 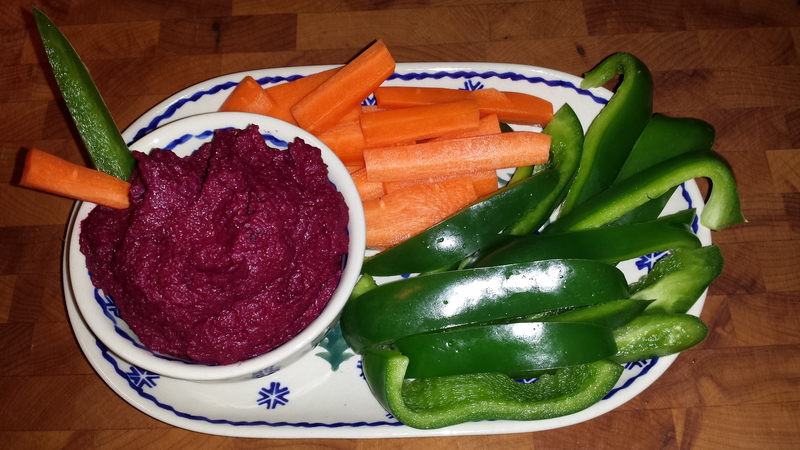 This is another simple recipe, after baking the beets for 45 minutes, the dip only took me 10 minutes to pull together. This recipe will serve 4-6 people so if you have a larger crowd be sure to double it. Wash beets, cut ends off, cut beets into quarters, toss in baking pan with enough olive oil to coat, sprinkle with salt-add garlic cloves. Bake for 45 minutes. Remove garlic cloves if they get dark, set aside to cool. Remove beets, let cool 10 minutes. Add beets and remaining ingredients a few at a time, leaving beans until last, to a food processor or blender and blend until smooth and creamy. Put into bowl, cover and chill at least an hour. Serve with fresh vegetables such as peppers, carrot sticks, celery sticks, broccoli & cauliflower crowns or any other favorite veggies. This dip is SO tasty on day 2 and 3! The flavors truly shine through.